BKArr1 | Bat Kama At ? How fragile are the traces of the past ? Cette photographie qui était dans les archives familiales et que ma mère a conservé pendant la guerre n’était pas datée. Rosa Portnoi avait découpé sa partie centrale où figuraient des lettres hébraïques. C’est en 2008, dans les archives de Tuvie Balshem, l’un des rédacteurs du Sefer Telz que l’auteur remarque un montage de 8 photographies de classe de l’école élémentaire Yavne réalisé en 1931, 4 classes de filles à gauche, 4 classes de garçons à droite. La deuxième photo (2e année école élémentaire) des filles est presque semblable à celle de Rosa Portnoi, les fillettes sont dans le même ordre, seuls manquent sur les côtés les enseignants, dont les portraits individuels figurent ici au centre du montage. This photograph from the family archives was saved by the author’s mother through the war. It was not dated. For her savety, Rosa Portnoi cut out the Hebrew inscriptions that were in the top center. In 2008, the author noticed a photo montage in the personal album of Tuvie Balshem, one of the editors of the Sefer Telz, showing 8 class photographs of the Yavne elementary school from 1931, 4 classes of boys on the right, and 4 of girls on the left. The second photo (2nd year of elementary school) of the girls is almost identical to the one of Rosa Portnoi, the little girls are in the same order, the teachers are missing on both sides but their portraits are in the middle of the photo montage. We know now for sure that this photo was taken the same day of 1931. 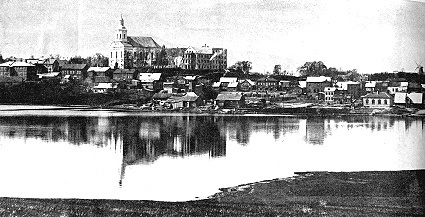 Before having discovered the existence of the Archives in Vilnius, the author has learned a lot from this photograph and from her mother’s narrative. From the presence of the écorché and the skeleton, the map of the world, the importance of the sciences and of geography was obvious. Both parents of the author have identified the Professor Pshadmeski (top left) who taught gymnastic in the girl’s school as well as in the boy’s heder, Professor Blekhman who has completed her studies in the gymnasium Yavne in 1928 (married Kimhi, middle left) taught humash, and Pofessor Poretz (bottom left) taught religion. 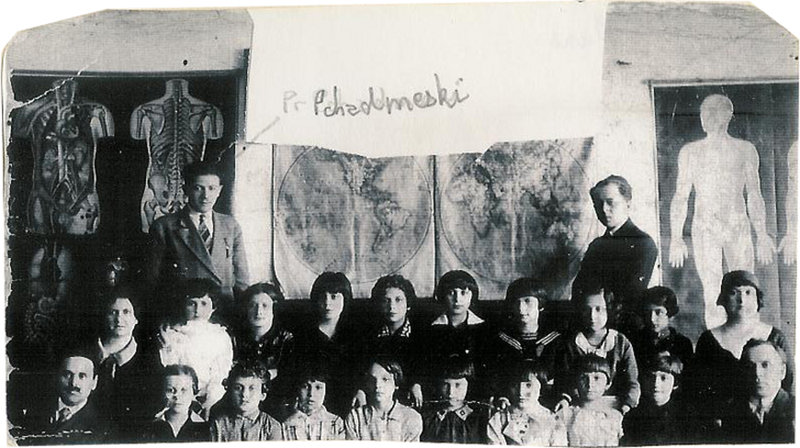 The professor Golub (middle right) taught mathematics and was both feared and beloved by the children. Professor Abba Manchovski (bottom right) was the director of the elementary school. The name of the young man standing (top right) Yoel Dov Saks, the administrator of the Yeshiva was recently given to the author by the rebbetsin Shoshana Gifter (née Bloch).